Crafting five-star Italian Shrimp Scampi is a feat best left to world-class chefs... and you! You can now enjoy this undeniable Italian favorite in the comfort of your own home... in under 15 minutes! 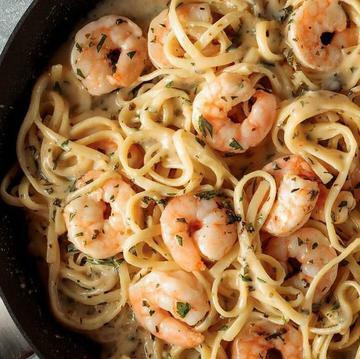 Shrimp Scampi is an all-in-one Italian dinner that starts with generous portions of sweet, succulent shrimp. These fresh and meaty morsels sauté in a zesty blend of garlic, white wine, real butter, and lemon juice for a small, yet noticeable punch of citrus. The pièce de résistance is when this restaurant-quality mix is then poured over a bed of thick linguine pasta... included in the meal, of course! This definitive dining masterpiece makes will transform any night of the week into a true culinary delight with ease. Do not thaw! Keep frozen until ready to cook. Appliances vary, adjust cook time accordingly. FOR FOOD SAFETY AND QUALITY, FOLLOW THESE COOKING INSTRUCTIONS. FOOD MUST BE COOKED TO AN INTERNAL TEMPERATURE OF 165�F AS INDICATED BY A FOOD THERMOMETER. Stove Top: Pre-heat 10-inch NONSTICK skillet on stove top over medium-high heat. Add contents of bag and 1/4 cup water to skillet. Cover and cook 6 minutes, stirring occasionally. Remove lid and cook an additional 3 minutes stirring occasionally. When shrimp is pink and sauce is hot and bubbling, remove skillet from heat. Cover and let stand 1 minute. Stir and serve. Ingredients: SHRIMP (SHRIMP, SALT, SODIUM TRIPOLYPHOSPHATE), UNSALTED BUTTER (CREAM, MILK), CHABLIS WINE (CONTAINS NATURALLY OCCURRING SULFITES), MARGARINE (PALM OIL, PALM KERNEL OIL, CANOLA OIL, WATER, SALT, WHEY POWDER (MILK), VEGETABLE MONOGLYCERIDES, SOY LECITHIN, CITRIC ACID, NATURAL FLAVOR, VITAMIN A PALMITATE, BETA-CAROTENE (COLOR), VITAMIN D3), WATER, GARLIC PUREE (GARLIC, CITRIC ACID, ASCORBIC ACID), CORN STARCH, SPICE BLEND, LEMON JUICE CONCENTRATE, SOY LECITHIN, OREGANO, LINGUINE PASTA (WATER, ENRICHED WHEAT SEMOLINA [SEMOLINA, NIACIN, IRON WITH FERROUS SULFATE, THIAMINE MONONITRATE, RIBOFLAVIN, FOLIC ACID], AND PASTEURIZED EGGS). CONTAINS: EGGS, MILK, SHRIMP, WHEAT, SULFITES, SOY.